You are, they say, what you eat. So as approximately 20 million students head back to college this fall, we got to wondering just what they will be eating. The truth may lie somewhere at the bottom of America’s takeout orders. The University of Buffalo, home to 30,000, students, leads the competition when it comes to making healthy choices when students log online for food delivery. To determine the most health conscious schools, GrubHub analyze deliveries, looking for the highest percentage of orders at schools that contained any of 31 options which suggested students had made healthy food choices, like substituting a salad for another side dish or telling restaurants to go light on dressing. What schools are most often ordering vegetables? The University of North Carolina tops the list, according to GrubHub’s analysis, followed by University of California, Berkeley, Stanford University, Harvard University and the University of Virginia. 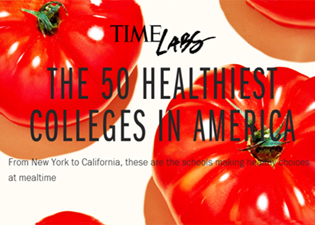 For the complete list of healthiest colleges, see below.